Today we are taking a trip to Sullivan’s Island. Dorothea Benton Frank will present her story. But where did it begin? Let’s meet the family who resides in the Island Gamble. She is also a big breast cancer awareness supporter. Susan is late for a meeting when she realizes that she has left a chart at the house for her presentation. She quickly drives back to pick it up only to make a discovery. Susan hears noises coming from the master bedroom. She opens the door to find her husband in bed with another woman. Susan and her husband Tom separate and she tries to put her life back together with their daughter Beth. There is one aspect of life where questions still creep up. What happened the night her daddy was murdered? Will she be able to put the pieces together and find peace? What other surprises could possibly be in store for Susan and her family? I loved this novel! Sullivan’s Island series is my favorite! It has great characters with their own complexities. This first novel introduces us to Susan and her family. We learn her history which will be played out over the other novels in the series. The plot alternates between the present and the past tells the story of what happened to her daddy. Readers will find this novel a true delight to read. 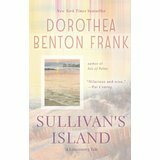 The story is set in the low country on Sullivan’s Island. A place I hope to visit someday. Bring on the next Dorothea Benton Frank novel! Please visit Dorothea Benton Frank on her Facebook page, Twitter, and her Website. Congrats to the winner of The Spice Box Letters! A House Full of Surprises!